We survived the semester. Steve took 18 hours, including two non-credit labs. Most of the burden fell on him, but it rippled over to the family as he was not as available for parenting tasks and household chores. And with three properties, there are a lot of chores. The best news? He got A's in all of the classes. Despite a To Do list that has every moment filled, I have to find time to plant 2,700 spring bulbs. That's right, thousands of little bulbs. Someone at church gave them to me Monday evening, surplus from a promotional giveaway. One man and I managed to plant about a thousand bulbs yesterday at church until it got too dark and cold to work any longer. Yes, I dug a little trench and dumped them in. Who knows what it will look like in the spring. I brought home about 500 bulbs to plant today (when???) and the rest are in the foyer at church. Perhaps I will give them away as party favors on Satuday. They are in cute little boxes already. This month's book is My Favorite Plant edited by Jamaica Kincaid. Carol has given us the option of just posting our favorite flower. Perhaps I need to read the book for inspiration, because my favorite plant changes frequently. I'm indiscriminate, a promiscuous plant person. So here are some of my phases. My garden is filled with remnants from my iris phase. I started with bearded irises, a demanding mistress. To remain vigorous, they need divided too often. The bloom period was short and the blooms were almost too showy. I lost interest in these demanding floozies, when I planted their well-behaved, refined cousin with attractive foliage, the Siberian iris. I have very tall dark purple, Butter & Sugar (yellow and white) and Steve (light blue). 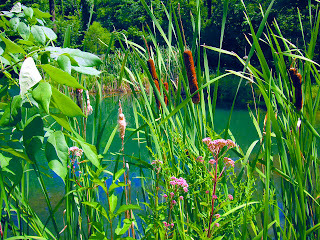 I then added a mix of Japanese iris and finally wild iris (blue flags and yellow flags) around the pond. These iris still give me great pleasure, but I can no longer label them "My Favorite Plant." Another phase was old roses. It started with transplanting Harison's Gold from an abandoned farmstead. 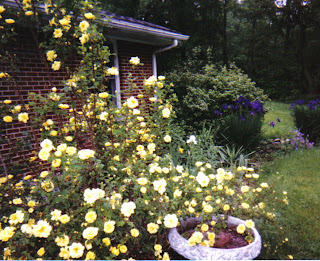 You can tell from the picture of the yellow roses that it thrived in my garden. Then I ordered several old roses, charmed by their history: Empress Josephine, Apothecary and several others whose names I have lost. 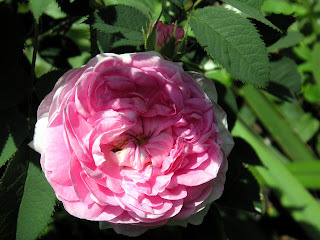 Moving on, I then planted about five types of David Austin roses, striving for the fragrance and form of the old roses but with repeat blooms. 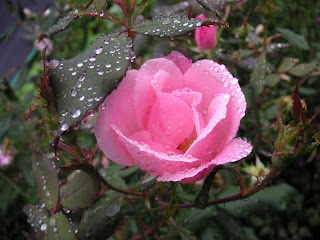 The last roses I planted were blushing Knock-Outs, not an old rose but still a nice addition to the garden. 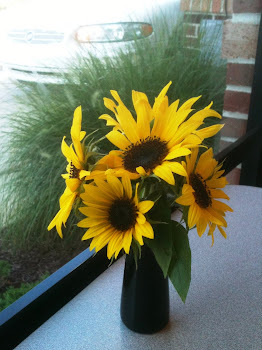 When I first moved here, my favorite plants were wildflowers, thanks to my meadow and woods. These are still some of my favorite flowers. I'm amazed at the color combinations and the health of these plants. I'm just finishing a container phase. I enjoy designing these "mini-gardens" because it was easy to experiment with plant combinations and colors. And then you combine the containers for a larger display. Next year I will still have some containers, but with 3 acres to plant and the watering demands of containers, I think I will scale back. Over the years, I've flirted with dianthus and still have three species and several cultivars in the garden. I'm still in love with Lady's Mantle. The foliage is so attractive and the chartreuse flowers fill in bouquets so nicely. Another favorite is columbine. And I could go on and on! I'm in the middle of a sedum phase. Do you know how many sedums there are and how different they look? 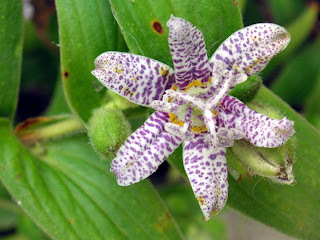 The blooms are unusual, usually red (from light pink to almost black) or yellow. The foliage is attractive from early spring to late fall, with a wide variation in color (light and dark green, red, dark purple) and form (trailers to upright). Planted together, they form a tapestry of color and shape. Perhaps I will get a picture of these next summer. 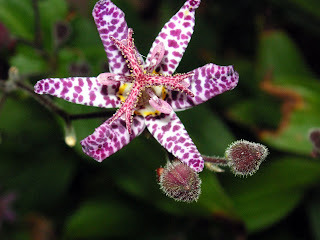 I'm just entering a tricyrtis or toad lily phase. I have three varieties and and longing for more as I peruse the garden catalogues. 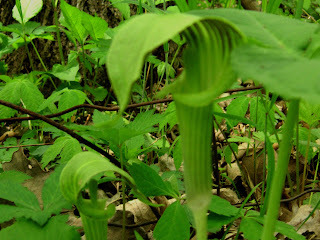 So with this long post, I think I have sufficiently supported my thesis: I am too fickle to have a favorite plant. This reminds me of a Robert Louis Stevenson poem I learned in my youth, which I have found to be true these many years (and I added another year today...Happy Birthday Earth Girl). This is not a good thing. We had heavy rains, then a deep freeze (17 degrees) and then a warming (41 degrees). 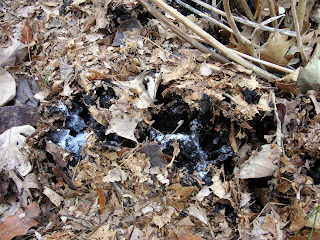 The result: frost heaving in November despite the leaf mulch. Here's your daily Martha dose, Renee, and thanks for the comment on my last post as it nudged me into action. Carol wondered if I had a name and so I do. It's Martha. No, I wasn't named after a maiden great aunt, but because my father thought it was a beautiful name. My sister and three brothers were all named after someone in the family. As a child, this bothered me; I was sure I was a changeling. I tried to transform myself into a Marty in Junior High School, but I was a Martha. The name was dropping in popularity about the time I was born, but was a very popular name when my father was young. (The link won't display the results of the name. You have to type it in so the Java app can run.) I even asked him once if he had a girlfriend with that name. He denied it, but I suspect there was a positive association at some time with the name. The origin of my name is Aramaic, the language Jesus spoke and it means lady. One of my favorite Bible verses is John 11:5: Jesus loved Martha. Why is it past tense though? Additional thought: At least my pet name isn't Quack Quack. 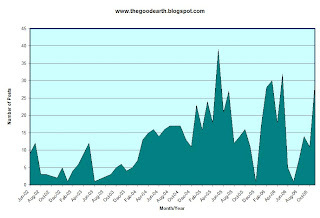 How did I do with the National Blog Posting Month experiment? I made 29 posts in November, which does not mean I only missed one day. I missed six days, but had multiple posts on other days. So I didn't make my goal, but I did a lot better than the 11 posts in October. The new Blogger monthly stats brought out my latent statistician tendencies, but I resisted doing a regression analysis. However, here is a chart showing that I tend to post most often in spring and fall. It also shows that if I have a heavy month of posts, it drops precipitously the next month. My first post was June 5, 2002.